A mast cell (also known as a mastocyte or a labrocyte) is a type of white blood cell. Specifically, it is a type of granulocyte derived from the myeloid stem cell that is a part of the immune and neuroimmune systems and contains many granules rich in histamine and heparin. Although best known for their role in allergy and anaphylaxis, mast cells play an important protective role as well, being intimately involved in wound healing, angiogenesis, immune tolerance, defense against pathogens, and blood–brain barrier function. The mast cell is very similar in both appearance and function to the basophil, another type of white blood cell. Although mast cells were once thought to be tissue resident basophils, it has been shown that the two cells develop from different hematopoietic lineages and thus cannot be the same cells. Mast cells were first described by Paul Ehrlich in his 1878 doctoral thesis on the basis of their unique staining characteristics and large granules. These granules also led him to the incorrect belief that they existed to nourish the surrounding tissue, so he named them Mastzellen (from German Mast, meaning "fattening", as of animals). They are now considered to be part of the immune system. Mast cells are very similar to basophil granulocytes (a class of white blood cells) in blood. Both are granulated cells that contain histamine and heparin, an anticoagulant. Both cells also release histamine upon binding to immunoglobulin E. These similarities have led many to speculate that mast cells are basophils that have "homed in" on tissues. Furthermore, they share a common precursor in bone marrow expressing the CD34 molecule. Basophils leave the bone marrow already mature, whereas the mast cell circulates in an immature form, only maturing once in a tissue site. The site an immature mast cell settles in probably determines its precise characteristics. The first in vitro differentiation and growth of a pure population of mouse mast cells has been carried out using conditioned medium derived from concanavalin A-stimulated splenocytes. Later, it was discovered that T cell-derived interleukin 3 was the component present in the conditioned media that was required for mast cell differentiation and growth. Mast cells in rodents are classically divided into two subtypes: connective tissue-type mast cells and mucosal mast cells. The activities of the latter are dependent on T-cells. Mast cells are present in most tissues characteristically surrounding blood vessels and nerves, and are especially prominent near the boundaries between the outside world and the internal milieu, such as the skin, mucosa of the lungs, and digestive tract, as well as the mouth, conjunctiva, and nose. Mast cells play a key role in the inflammatory process. When activated, a mast cell can either selectively release (piecemeal degranulation) or rapidly release (anaphylactic degranulation) "mediators", or compounds that induce inflammation, from storage granules into the local microenvironment. Mast cells can be stimulated to degranulate by allergens through cross-linking with immunoglobulin E (IgE) receptors (e.g., FcεRI), physical injury through pattern recognition receptors for damage-associated molecular patterns (DAMPs), microbial pathogens through pattern recognition receptors for pathogen-associated molecular patterns (PAMPs), and various compounds through their associated G-protein coupled receptors (e.g., morphine through opioid receptors) or ligand-gated ion channels. Complement proteins can activate membrane receptors on mast cells to exert various functions as well. Mast cells express a high-affinity receptor (FcεRI) for the Fc region of IgE, the least-abundant member of the antibodies. This receptor is of such high affinity that binding of IgE molecules is in essence irreversible. As a result, mast cells are coated with IgE, which is produced by plasma cells (the antibody-producing cells of the immune system). IgE molecules, like all antibodies, are specific to one particular antigen. In allergic reactions, mast cells remain inactive until an allergen binds to IgE already coated upon the cell. Other membrane activation events can either prime mast cells for subsequent degranulation or act in synergy with FcεRI signal transduction. In general, allergens are proteins or polysaccharides. The allergen binds to the antigen-binding sites, which are situated on the variable regions of the IgE molecules bound to the mast cell surface. It appears that binding of two or more IgE molecules (cross-linking) is required to activate the mast cell. The clustering of the intracellular domains of the cell-bound Fc receptors, which are associated with the cross-linked IgE molecules, causes a complex sequence of reactions inside the mast cell that lead to its activation. Although this reaction is most well-understood in terms of allergy, it appears to have evolved as a defense system against parasites and bacteria. Histamine dilates post-capillary venules, activates the endothelium, and increases blood vessel permeability. This leads to local edema (swelling), warmth, redness, and the attraction of other inflammatory cells to the site of release. It also depolarizes nerve endings (leading to itching or pain). Cutaneous signs of histamine release are the "flare and wheal"-reaction. The bump and redness immediately following a mosquito bite are a good example of this reaction, which occurs seconds after challenge of the mast cell by an allergen. The other physiologic activities of mast cells are much less-understood. Several lines of evidence suggest that mast cells may have a fairly fundamental role in innate immunity: They are capable of elaborating a vast array of important cytokines and other inflammatory mediators such as TNFa; they express multiple "pattern recognition receptors" thought to be involved in recognizing broad classes of pathogens; and mice without mast cells seem to be much more susceptible to a variety of infections. Mast cell granules carry a variety of bioactive chemicals. These granules have been found to be transferred to adjacent cells of the immune system and neurons in a process of transgranulation via mast cell pseudopodia. FcεR1 is a high affinity IgE-receptor that is expressed on the surface of the mast cell. FcεR1 is a tetramer made of one alpha (α) chain, one beta (β) chain, and two identical, disulfide-linked gamma (γ) chains. The binding site for the IgE is formed by the extracellular portion of the α chain that contains two domains that are similar to Ig. One transmembrane domain contains an aspartic acid residue, and one contains a short cytoplasmic tail. The β chain contains, a single immunoreceptor tyrosine-based activation motif ITAM, in the cytoplasmic region. Each γ chain has one ITAM on the cytoplasmic region. The signaling cascade from the receptor is initiated when the ITAMs of the β and γ chains are phosphorylated by tyrosine. This signal is required for the activation of mast cells. Type 2 helper T cells,(Th2) and many other cell types lack the β chain, so signaling is mediated only by the γ chain. This is due to the α chain containing endoplasmic reticulum retention signals that causes the α-chains to remain degraded in the ER. The assembly of the α chain with the co-transfected β and γ chains mask the ER retention and allows the α β γ complex to be exported to the golgi apparatus to the plasma membrane in rats. In humans, only the γ complex is needed to counterbalance the α chain ER retention. Allergen-mediated FcεR1 cross-linking signals are very similar to the signaling event resulting in antigen binding to lymphocytes. The Lyn tyrosine kinase is associated with the cytoplasmic end of the FcεR1 β chain. The antigen cross-links the FcεR1 molecules, and Lyn tyrosine kinase phosphorylates the ITAMs in the FcεR1 β and γ chain in the cytoplasm. Upon phosphorylation, the Syk tyrosine kinase gets recruited to the ITAMs located on the γ chains. This causes activation of the Syk tyrosine kinase, causing it to phosphorylate. Syk functions as a signal amplifying kinase activity due to the fact that it targets multiple proteins and causes their activation. This antigen stimulated phosphorylation causes the activation of other proteins in the FcεR1-mediated signaling cascade. An important adaptor protein activated by the Syk phosphorylation step is the linker for activation of T cells (LAT). LAT is important because it can be modified by phosphorylation to create novel binding sites. Phospholipase C (PLCγ), becomes phosphorylated once bound to LAT, and is then used to catalyze Phosphatidylinositol bisphosphate breakdown to yield inositol trisphosphate (IP3) and diacyglycerol (DAG). IP3 elevates calcium levels, and DAG activates protein kinase C (PKC). This is not the only way that PKC is made. The tyrosine kinase, Fyn, phosphorylates a Grb-2-associated binder-like protein 2 (Gab2) which binds to phosphoinositide 3-kinase which activates PKC.PKC leads to the activation of myosin light-chain phosphorylation granule movements which disassembles the actin-myosin complexes to allow granules to come into contact with the plasma membrane. The mast cell granule can now fuse with the plasma membrane. Soluble N-ethylmaleimide sensitive fusion Attachment Protein Receptor SNARE complex mediates this process. Different SNARE proteins interact to form different complexes that catalyze fusion. Rab3 guanosine triphosphatases and Rab-associated kinases and phosphatases regulate the cell granule membrane fusion in resting mast cells. Mast cells are activated in response to infection by pathogenic parasites, such as certain helminths and protozoa, through IgE signaling. Mast cell activation disorders are a spectrum of immune disorders that are unrelated to pathogenic infection and involve similar symptoms that arise from secreted mast cell intermediates, but differ slightly in their pathophysiology, treatment approach, and distinguishing symptoms. The classification of mast cell activation disorders was laid out in 2010. 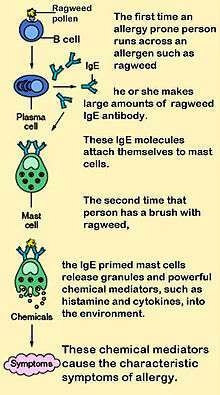 Allergies are mediated through IgE signaling which triggers mast cell degranulation. Many forms of cutaneous and mucosal allergy are mediated in large part by mast cells; they play a central role in asthma, eczema, itch (from various causes), and allergic rhinitis and allergic conjunctivitis. Antihistamine drugs act by blocking histamine action on nerve endings. Cromoglicate-based drugs (sodium cromoglicate, nedocromil) block a calcium channel essential for mast cell degranulation, stabilizing the cell and preventing release of histamine and related mediators. Leukotriene antagonists (such as montelukast and zafirlukast) block the action of leukotriene mediators and are being used increasingly in allergic diseases. Calcium triggers the secretion of histamine from mast cells after previous exposure to sodium fluoride. The secretory process can be divided into a fluoride-activation step and a calcium-induced secretory step. It was observed that the fluoride-activation step is accompanied by an elevation of cAMP levels within the cells. The attained high levels of cAMP persist during histamine release. It was further found that catecholamines do not markedly alter the fluoride-induced histamine release. It was also confirmed that the second, but not the first, step in sodium fluoride-induced histamine secretion is inhibited by theophylline. Vasodilation and increased permeability of capillaries are a result of both H1 and H2 receptor types. Stimulation of histamine activates a histamine (H2)-sensitive adenylate cyclase of oxyntic cells, and there is a rapid increase in cellular [cAMP] that is involved in activation of H+ transport and other associated changes of oxyntic cells. In anaphylaxis (a severe systemic reaction to allergens, such as nuts, bee stings, or drugs), the body-wide degranulation of mast cells leads to vasodilation and, if severe, symptoms of life-threatening shock. Mastocytosis is a rare clonal mast cell disorder involving the presence of too many mast cells (mastocytes) and CD34+ mast cell precursors. Mutations in c-Kit are associated with mastocytosis. Mastocytomas, or mast cell tumors, can secrete excessive quantities of degranulation products. They are often seen in dogs and cats. Other neoplastic disorders associated with mast cells include mast cell sarcoma and mast cell leukemia. Mast cell activation syndrome (MCAS) is an idiopathic immune disorder that involves recurrent and excessive mast cell degranulation and which produces symptoms that are similar to other mast cell activation disorders. The syndrome is diagnosed based upon four sets of criteria involving treatment response, symptoms, a differential diagnosis, and biomarkers of mast cell degranulation. Unlike other hematopoietic cells, mast cells naturally occur in the brain where they interact with the neuroimmune system. In the human brain, mast cells are located in a number of structures which mediate visceral sensory (e.g., pain) or neuroendocrine functions – including the pituitary stalk, pineal gland, thalamus, and hypothalamus – or which are located at the blood–brain barrier or blood–cerebrospinal fluid barrier, including the area postrema, choroid plexus, and in the dural layer of the meninges near meningeal nociceptors. Mast cells serve the same general functions in the body and central nervous system, such as effecting or regulating allergic responses, innate and adaptive immunity, autoimmunity, and inflammation. Across systems, mast cells serve as the main effector cell through which pathogens can affect the brain-gut axis. In the gastrointestinal tract, mucosal mast cells are located in close proximity to sensory nerve fibres, which communicate bidirectionally. When these mast cells initially degranulate, they release mediators (e.g., histamine, tryptase, and serotonin) which activate, sensitize, and upregulate membrane expression of nociceptors (i.e., TRPV1) on visceral afferent neurons via their receptors (respectively, HRH1, HRH2, HRH3, PAR2, 5-HT3); in turn, neurogenic inflammation, visceral hypersensitivity, and intestinal dysmotility (i.e., impaired peristalsis) result. Neuronal activation induces neuropeptide (substance P and calcitonin gene-related peptide) signaling to mast cells where they bind to their associated receptors and trigger degranulation of a distinct set of mediators (β-Hexosaminidase, cytokines, chemokines, PGD2, leukotrienes, and eoxins). Toluidine blue: one of the most common stains for acid mucopolysaccharides and glycoaminoglycans, components of mast cells granules. Surface markers: cell surface markers of mast cells were discussed in detail by Heneberg, claiming that mast cells may be inadvertently included in the stem or progenitor cell isolates, since part of them is positive for the CD34 antigen. The classical mast cell markers include the high-affinity IgE receptor, CD117 (c-Kit), and CD203c (for most of the mast cell populations). Expression of some molecules may change in course of the mast cell activation. 1 2 3 4 Polyzoidis S, Koletsa T, Panagiotidou S, Ashkan K, Theoharides TC (2015). "Mast cells in meningiomas and brain inflammation". J Neuroinflammation. 12 (1): 170. doi:10.1186/s12974-015-0388-3. PMC 4573939 . PMID 26377554. MCs originate from a bone marrow progenitor and subsequently develop different phenotype characteristics locally in tissues. Their range of functions is wide and includes participation in allergic reactions, innate and adaptive immunity, inflammation, and autoimmunity . In the human brain, MCs can be located in various areas, such as the pituitary stalk, the pineal gland, the area postrema, the choroid plexus, thalamus, hypothalamus, and the median eminence . In the meninges, they are found within the dural layer in association with vessels and terminals of meningeal nociceptors . MCs have a distinct feature compared to other hematopoietic cells in that they reside in the brain . MCs contain numerous granules and secrete an abundance of prestored mediators such as corticotropin-releasing hormone (CRH), neurotensin (NT), substance P (SP), tryptase, chymase, vasoactive intestinal peptide (VIP), vascular endothelial growth factor (VEGF), TNF, prostaglandins, leukotrienes, and varieties of chemokines and cytokines some of which are known to disrupt the integrity of the blood-brain barrier (BBB) [38–40]. ↑ "Distinguishing mast cell and granulocyte differentiation at the single-cell level". Cell Stem Cell. 6: 361–8. 2010. doi:10.1016/j.stem.2010.02.013. PMC 2852254 . PMID 20362540. ↑ Ehrlich, P. (1878). Beiträge zur Theorie und Praxis der histologischen Färbung [Contribution to the theory and practice of histological dyes] (Dissertation) (in German). Leipzig University. OCLC 63372150. ↑ Marieb, Elaine N.; Hoehn, Katja (2007). Human Anatomy and Physiology (7th ed.). San Francisco: Pearson Benjamin Cummings. p. 659. ISBN 978-0-8053-5910-7. 1 2 3 4 5 6 Prussin C, Metcalfe DD (February 2003). "4. IgE, mast cells, basophils, and eosinophils". The Journal of Allergy and Clinical Immunology. 111 (2 Suppl): S486–94. doi:10.1067/mai.2003.120. PMID 12592295. ↑ Razin E, Ihle JN, Seldin D, et al. (March 1984). "Interleukin 3: A differentiation and growth factor for the mouse mast cell that contains chondroitin sulfate E proteoglycan". Journal of Immunology. 132 (3): 1479–86. PMID 6198393. ↑ Denburg, Judah A. (1998). Allergy and allergic diseases: the new mechanisms and therapeutics. Totowa, NJ: Humana Press. ISBN 0-89603-404-6. 1 2 3 4 5 Moon TC, Befus AD, Kulka M (2014). "Mast cell mediators: their differential release and the secretory pathways involved". Front Immunol. 5: 569. doi:10.3389/fimmu.2014.00569. PMC 4231949 . PMID 25452755. Two types of degranulation have been described for MC: piecemeal degranulation (PMD) and anaphylactic degranulation (AND) (Figures 1 and 2). Both PMD and AND occur in vivo, ex vivo, and in vitro in MC in human (78–82), mouse (83), and rat (84). PMD is selective release of portions of the granule contents, without granule-to-granule and/or granule-to-plasma membrane fusions. ... In contrast to PMD, AND is the explosive release of granule contents or entire granules to the outside of cells after granule-to-granule and/or granule-to-plasma membrane fusions (Figures 1 and 2). Ultrastructural studies show that AND starts with granule swelling and matrix alteration after appropriate stimulation (e.g., FcεRI-crosslinking). ↑ Pulendran B, Ono SJ (May 2008). "A shot in the arm for mast cells". Nat. Med. 14 (5): 489–90. doi:10.1038/nm0508-489. PMID 18463655. ↑ Lee J, Veatch SL, Baird B, Holowka D (2012). "Molecular mechanisms of spontaneous and directed mast cell motility". J. Leukoc. Biol. 92 (5): 1029–41. doi:10.1189/jlb.0212091. PMC 3476239 . PMID 22859829. ↑ Ashmole I, Bradding P (May 2013). "Ion channels regulating mast cell biology". Clin. Exp. Allergy. 43 (5): 491–502. doi:10.1111/cea.12043. PMID 23600539. P2X receptors are ligand-gated non-selective cation channels that are activated by extracellular ATP. ... Increased local ATP concentrations are likely to be present around mast cells in inflamed tissues due to its release through cell injury or death and platelet activation . Furthermore, mast cells themselves store ATP within secretory granules, which is released upon activation . There is therefore the potential for significant Ca2+ influx into mast cells through P2X receptors. Members of the P2X family differ in both the ATP concentration they require for activation and the degree to which they desensitise following agonist activation [37, 38]. This opens up the possibility that by expressing a number of different P2X receptors mast cells may be able to tailor their response to ATP in a concentration dependent manner . ↑ Wilhelm M, Silver R, Silverman AJ (November 2005). "Central nervous system neurons acquire mast cell products via transgranulation". The European Journal of Neuroscience. 22 (9): 2238–48. doi:10.1111/j.1460-9568.2005.04429.x. PMC 3281766 . PMID 16262662. 1 2 Kinet JP (1999). "The high-affinity IgE receptor (FcεRI): from physiology to pathology". Annual Review of Immunology. 17: 931–72. doi:10.1146/annurev.immunol.17.1.931. PMID 10358778. 1 2 3 Abbas, Abul K.; Lichtman, Andrew H. H.; Pillai, Shiv (2011). "Role of Mast Cells, Basophils and Eosinophils in Immediate Hypersensitivity". Cellular and Molecular Immunology (7th ed.). New York, NY: Elsevier. ISBN 978-1-4377-1528-6. 1 2 Rivera J, Cordero JR, Furumoto Y, et al. (September 2002). "Macromolecular protein signaling complexes and mast cell responses: a view of the organization of IgE-dependent mast cell signaling". Molecular Immunology. 38 (16-18): 1253–8. doi:10.1016/S0161-5890(02)00072-X. PMID 12217392. ↑ Li W, Deanin GG, Margolis B, Schlessinger J, Oliver JM (July 1992). "FcεR1-mediated tyrosine phosphorylation of multiple proteins, including phospholipase Cγ1 and the receptor βγ2 complex, in RBL-2H3 rat basophilic leukemia cells". Molecular and Cellular Biology. 12 (7): 3176–82. PMC 364532 . PMID 1535686. Recurrent idiopathic anaphylaxis presents with allergic signs and symptoms—hives and angioedema which is a distinguishing feature—eliminates identifiable allergic etiologies, considers mastocytosis and carcinoid syndrome, and is treated with H1 and H2 antihistamines, epinephrine, and steroids [21, 22]. 1 2 3 4 5 Akin C, Valent P, Metcalfe DD (2010). 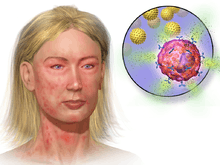 "Mast cell activation syndrome: Proposed diagnostic criteria". J. Allergy Clin. Immunol. 126 (6): 1099–104.e4. doi:10.1016/j.jaci.2010.08.035. PMC 3753019 . PMID 21035176. ↑ Alm PE (April 1983). "Sodium fluoride evoked histamine release from mast cells. A study of cyclic AMP levels and effects of catecholamines". Agents and Actions. 13 (2-3): 132–7. doi:10.1007/bf01967316. PMID 6191542. 1 2 Dachman WD, Bedarida G, Blaschke TF, Hoffman BB (March 1994). "Histamine-induced venodilation in human beings involves both H1 and H2 receptor subtypes". The Journal of Allergy and Clinical Immunology. 93 (3): 606–14. doi:10.1016/S0091-6749(94)70072-9. PMID 8151062. ↑ Machen TE, Rutten MJ, Ekblad EB (February 1982). "Histamine, cAMP, and activation of piglet gastric mucosa". The American Journal of Physiology. 242 (2): G79–84. PMID 6175225. ↑ Lee DM, Friend DS, Gurish MF, Benoist C, Mathis D, Brenner MB (September 2002). "Mast cells: a cellular link between autoantibodies and inflammatory arthritis". Science. 297 (5587): 1689–92. doi:10.1126/science.1073176. PMID 12215644. ↑ Horny HP, Sotlar K, Valent P (2007). "Mastocytosis: state of the art". Pathobiology. 74 (2): 121–32. doi:10.1159/000101711. PMID 17587883. ↑ "Cutaneous Mast Cell Tumors". The Merck Veterinary Manual. 2006. Retrieved 2007-07-08. 1 2 Carabotti M, Scirocco A, Maselli MA, Severi C (2015). "The gut-brain axis: interactions between enteric microbiota, central and enteric nervous systems". Ann Gastroenterol. 28 (2): 203–209. PMC 4367209 . PMID 25830558. 1 2 3 4 Wouters MM, Vicario M, Santos J (2015). "The role of mast cells in functional GI disorders". Gut. 65: 155–168. doi:10.1136/gutjnl-2015-309151. PMID 26194403. Functional gastrointestinal disorders (FGIDs) are characterized by chronic complaints arising from disorganized brain-gut interactions leading to dysmotility and hypersensitivity. The two most prevalent FGIDs, affecting up to 16–26% of worldwide population, are functional dyspepsia and irritable bowel syndrome. ... It is well established that mast cell activation can generate epithelial and neuro-muscular dysfunction and promote visceral hypersensitivity and altered motility patterns in FGIDs, postoperative ileus, food allergy and inflammatory bowel disease. ▸ Mast cells play a central pathophysiological role in IBS and possibly in functional dyspepsia, although not well defined. ▸ Treatment with mast cell stabilisers offers a reasonably safe and promising option for the management of those patients with IBS non-responding to conventional approaches, though future studies are warranted to evaluate efficacy and indications. ↑ Theoharides TC, Angelidou A, Alysandratos KD, et al. (January 2012). "Mast cell activation and autism". Biochimica et Biophysica Acta. 1822 (1): 34–41. doi:10.1016/j.bbadis.2010.12.017. PMID 21193035. ↑ Blumenkrantz N, Asboe-Hansen G (May 1975). "A selective stain for mast cells". The Histochemical Journal. 7 (3): 277–82. doi:10.1007/BF01003596. PMID 47855. ↑ Heneberg P (November 2011). "Mast cells and basophils: trojan horses of conventional lin- stem/progenitor cell isolates". Current Pharmaceutical Design. 17 (34): 3753–71. doi:10.2174/138161211798357881. PMID 22103846. ↑ Lebduska P, Korb J, Tůmová M, Heneberg P, Dráber P (December 2007). "Topography of signaling molecules as detected by electron microscopy on plasma membrane sheets isolated from non-adherent mast cells". Journal of Immunological Methods. 328 (1-2): 139–51. doi:10.1016/j.jim.2007.08.015. PMID 17900607. Look up mast cell in Wiktionary, the free dictionary.